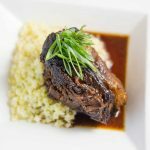 Our Keto Braised Beef Cheeks is an Asian style slow cooker recipe that features regularly at My Keto Kitchen. Sticky and tender meat with a salty, sweet, orange-scented sauce. Peel thick strips of the zest from the orange, using a vegetable peeler. Place in your slow cooker. Add the scallions, garlic, ginger, cooking wine, tamari, sweetener, sesame oil, star anise and cinnamon to your slow cooker. Stir until the sweetener has dissolved. Add the beef cheeks and coat in the sauce. .Serve the beef cheeks with a little cooking broth and a side of cauliflower rice.